Glyphosate herbicide drift on mum. Affects all plants. Glyphosate is a non-selective herbicide. Trees and plants with woody stems can be treated at the base of the plant with a glyphosate containing product if label is followed. Woody plants with brown and dark bark coloration is less suseptible to injury that ones with tan, green, or light colored bark. The list below of specific plants is NOT all inclusive. It reflects the authors' experience as well as University of Illinois herbicide injury research trial results. This herbicide inhibits a key enzyme in the amino acid synthesis pathway. Translocated in both xylem and phloem. 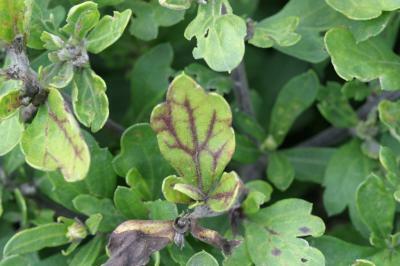 Slow chlorosis/necrosis of plant tissue. Symptoms typically appear in 10 to 14 days after exposure. A change in flower color may be noticed. Use caution when applying herbicides around plants as desirable plants may be sensitive and injury may result. Do not spray during cool, wet weather as herbicide is metabolized slower at these times. Do not spray when wind speed and direction are such that herbicide drift is likely to occur. Affected plants may or may not survive herbicide drift; it depends on both the degree of exposure and the plant's tolerance to the herbicide. Water and fertilize plants as needed to promote good plant health. Illinois residents: If you suspect herbicide injury as a result of off-target movement from a nearby application and you are interested in filing a complaint with the Illinois Department of Agriculture, call the Illinois Department of Agriculture's Bureau of Environmental Programs at 1-800-641-3934. To learn more about spray drift and the formal complaint process, visit the Illinois Pesticide Safety Education Spray Drift Resources website. Non-Illinois residents: If you are interested in filing a complaint, contact your state pesticide control official via the Association of American Pesticide Control Officials website. A list (maintained by Univ. of IL - Crop Sciences) of herbicide residue testing labs.